New Waterford-to-Halifax writer and singer Norma MacDonald returns four years after Morning You Wake with her new one, a winner on all counts. Burn The Tapes sees MacDonald deliver a 10-song set of concise, beautiful tracks, sometimes eerie, other times life-affirming. It's country-folk with an edge, acoustic and dark, something I like to think of as camp fire music. 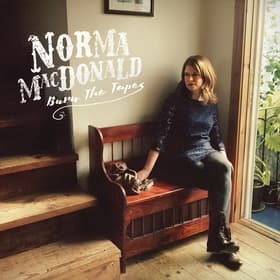 You could easily picture her doing many of these songs sitting around a fire, with maybe a fiddle or mandolin player joining in, hopefully somebody has a button accordion. It's good night-time music, with a sad and lonesome sound and MacDonald's easy-to-love vocals, which I'd describe as slightly haunted, to borrow a phrase from singer Lynn Miles. She's not all about tears and heartache though; just like that camp fire, there's warmth and healing in equal parts in her music. In the song Blue As A Joy, she tells us she's both "Bold as a gull and blue as a jay". So you get those two sides, confidence in the face of life's tough moments. There is a good-time vibe to some of the songs, as she gets the tempo going on tracks such as Old Song, a nice sing-along number. For the most part it's acoustic music, not a whole lot of drumming or electric instruments, it's a very traditional production that focuses on MacDonald's voice. She produced the album herself, so this was what she was looking for, this purer version of country folk, perhaps the way Emmy Lou Harris or Linda Ronstadt were making records back in the 70's, that's the early Linda Ronstadt of course. On the dark, haunted side, there are a couple of unsettling moments for sure. One song, Lighten Up, is a duet with fellow Nova Scotia singer Gabe Minnikin, one-time member of the like-minded countryish band The Guthries. He has a spooky voice to begin with, so it sounds a bit like a car trip down a deserted, night time highway. Another one with that vibe is called To Nebraska, which is her tribute to that most haunting album, Bruce Springsteen's Nebraska, and it's just blue on blue, heartache on heartache. Anyway, there isn't a moment on this album where your emotions aren't at work, highs and lows.